The mouthbow, like the drum, is found in many parts of the world, particularly wherever people use bows and arrows for hunting. I guess that sooner or later the musician in the group figures out how to make music on a weapon. Long ago, people used flax or fiber or sinew for the string, and wood for the tuning peg. The ones I make have a metal guitar string and tuning peg. The mouthbow is said to be the oldest stringed instrument in the world. Although simple, it is intriguing because of the ability to play harmonics with it, just by the way you change the shape of your mouth while plucking the string. The mouthbow depends upon three things at once for its unusual sound. Picking the string, very close to your mouth, makes the string vibrate. Changing the shape of your mouth at the same time, so that the soundwave coming off the string reflects off the inside surfaces of your mouth makes harmonics. Harmonics are extra sounds you can hear above the sound of the vibrating string itself. Bending the bow slightly changes the entire pitch of the string and the entire set of harmonics. You dont have to know all this in order to play a mouthbow. To play it, if you are right handed, hold the stick of the bow with your left hand at the thicker end that has the tuning peg. Rest the thin end across your mouth, not in it. Pluck the string with a thin guitar pick, a flattened feather quill, or a pick you make by cutting up a plastic bottle such as dish detergent comes in. As you pick the string over and over again quite rapidly, try mouthing the sound wow-wow-wow-wow silently and notice that in addition to the sound you get just from plucking the string, you hear other faint notes as well. These other faint notes are the harmonic overtones you are looking for. Dont over tighten the string as it can snap and break. When putting on a new string or when tightening the string, keep it away from faces. The end of the string is sharp. Dont try to use it like a hunting bow, as its fragile. 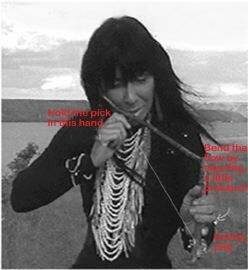 See the video about mouthbows on the SCIENCE: Through Native American Eyes CD-ROM. The Principles of Sound section has the video lesson. The Cradleboard Jukebox has a song. My mouthbows vary in size and materials. Ive made little tiny ones and big long ones. The string I use in concert is usually a guitar first string (E), silk or steel so that it can be heard easily. However, its fun to experiment and Ive tried all sorts of strings: fiber, flax, sinew, banjo strings, viola and cello strings which can be bowed, and even rubber bands. The peg that keeps the string tight can also be made from a variety of materials and in different styles. A straight wood peg like the one used on an Apache violin works fine. But I like to tune my bow precisely and work with other instruments, so I favor a geared peg, like the Grover peg in the picture. There are lots of other kinds of musical bows. 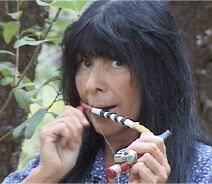 In the rain forests of the Amazon, the indigenous musicians there make bows as tall as a man, to which they affix a gourd, which serves as the resonator instead of using your mouth as the resonator. That instrument is called a birimbao, and you sometimes see musicians from Brazil playing birimbaos onstage with other instruments. The country and folk singer Jimmy Driftwood plays a picking bow made from a spinning wheel. Mouthbows and other musical bows can also be bowed like a violin. A bow bowing a bow!